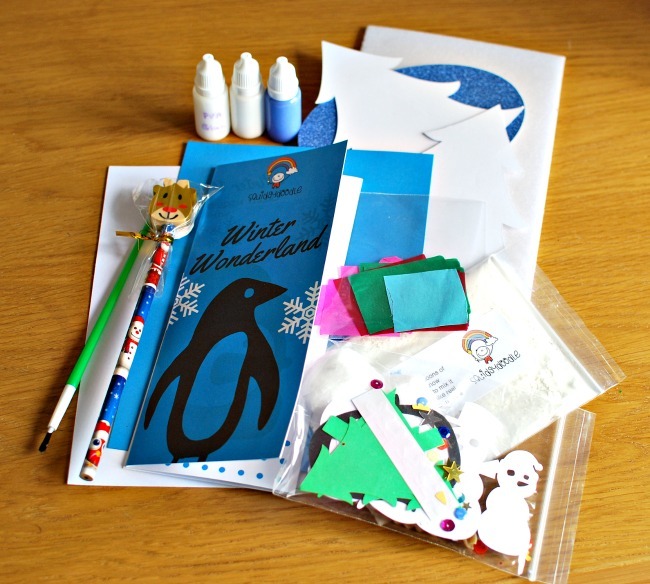 Squidgydoodle sell craft and party boxes for children aged 3 - 8 years old. 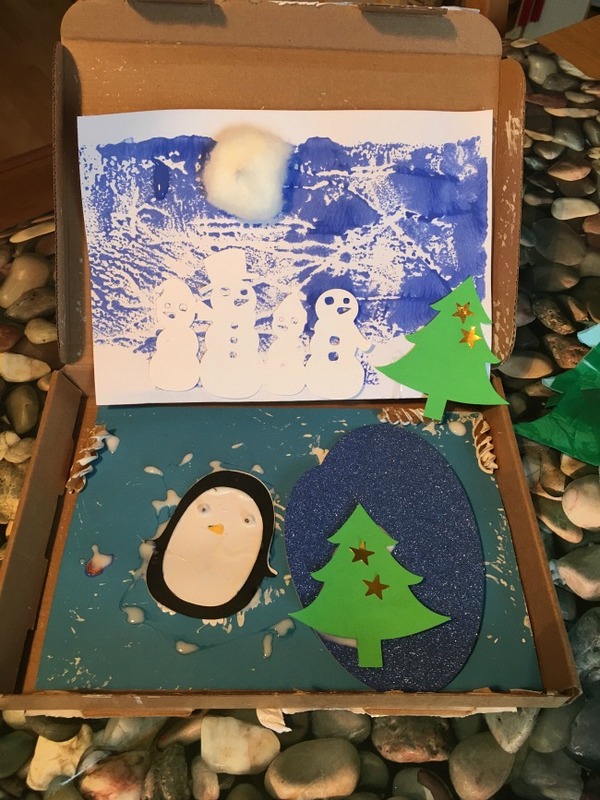 Each box is handmade and full of art and sensory activities for children. 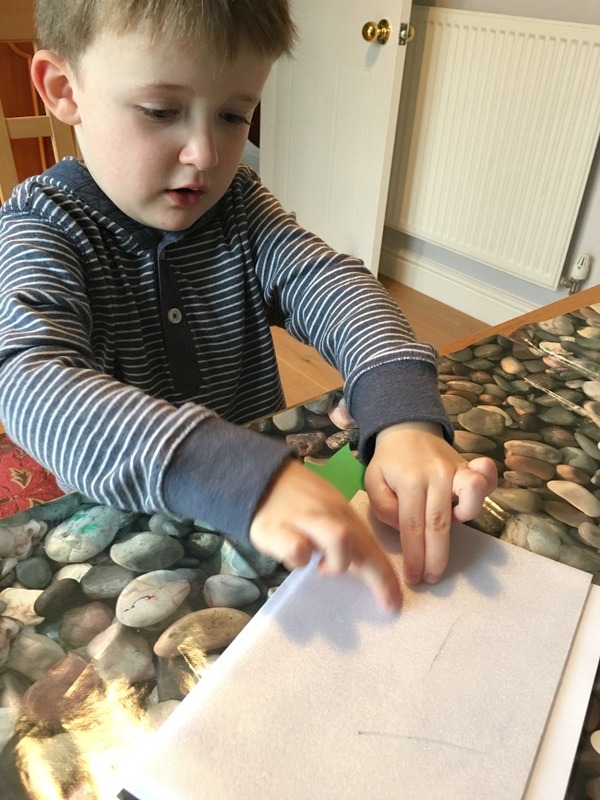 We love crafts and were delighted to review this handmade box. 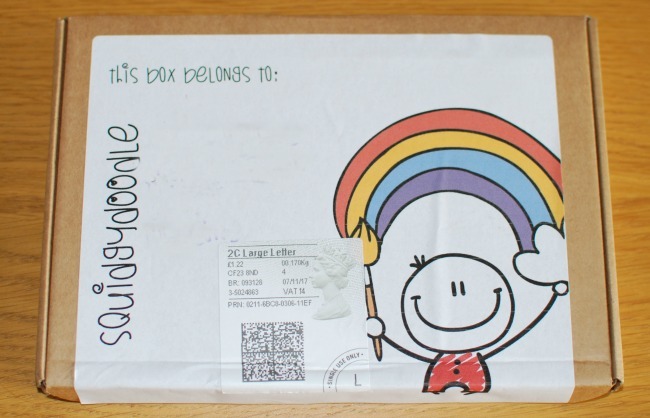 Delivery is included in the price and the box fits through the letterbox, so no need to stay in waiting for the parcel. The box is packed with everything you need to complete the craft. I took the contents out of the box, and they kept on coming. Little bags with tissue paper squares, paper cut out shapes, intriguing bottles with white and blue paint and one marked PVA glue. A paintbrush and a pencil...and more. 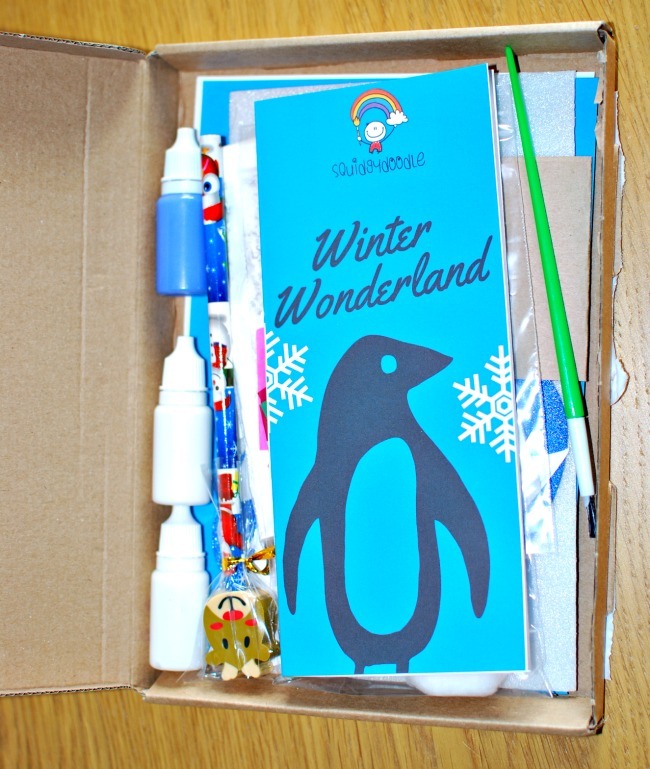 We received the Winter Wonderland Craft Box which contains everything needed to make your own magical winter scene. There is a little booklet describing what to do and although the description is detailed, I would have liked a picture too. Bear didn't need any directions or pictures. Once I explained the basics he just did his own thing. 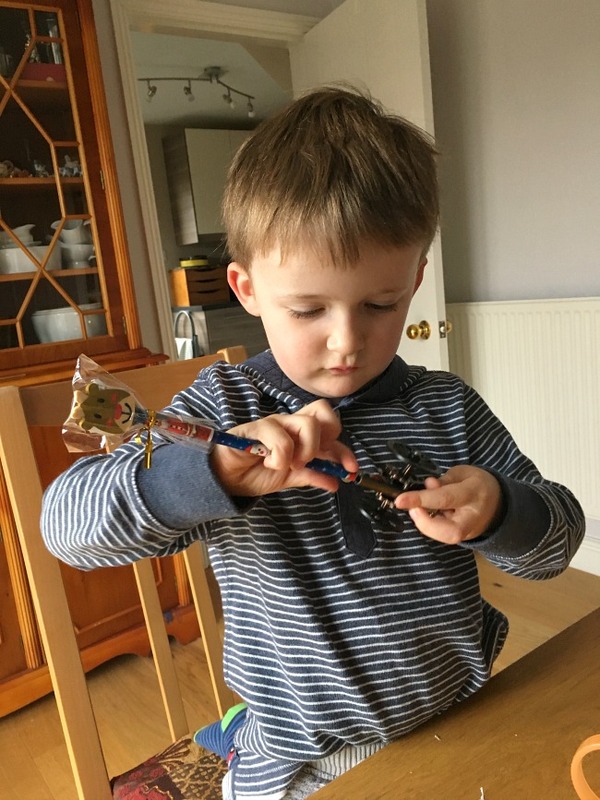 Firstly he sharpened the pencil. Then he asked for some paper and drew faces before getting back to the craft box. The scene is divided into four activities. 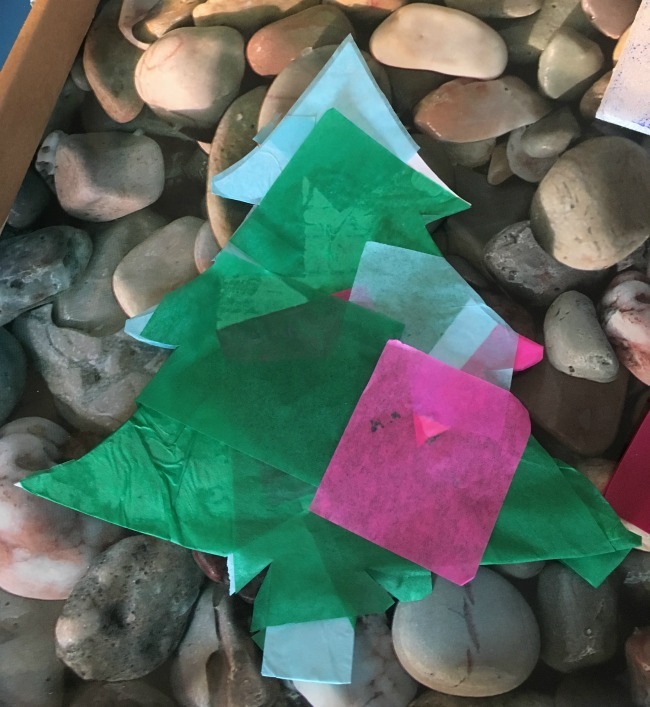 The first is to decorate a cut out tree with pieces of brightly coloured tissue paper. Bear loved painting the PVA glue onto the template and sticking the paper randomly onto the tree. He didn't like the idea of folding the paper over so when it dried a little I gave it a quick trim. 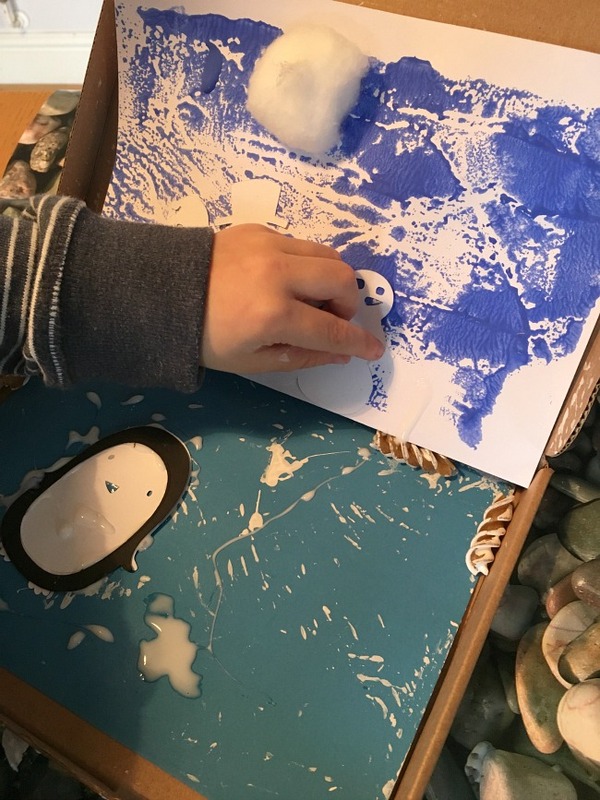 Next was to line the box with a piece of blue paper, paint some pasta white, put the wet painted pasta into the box and shake! Bear loved it. He shook, he looked, he shook again. 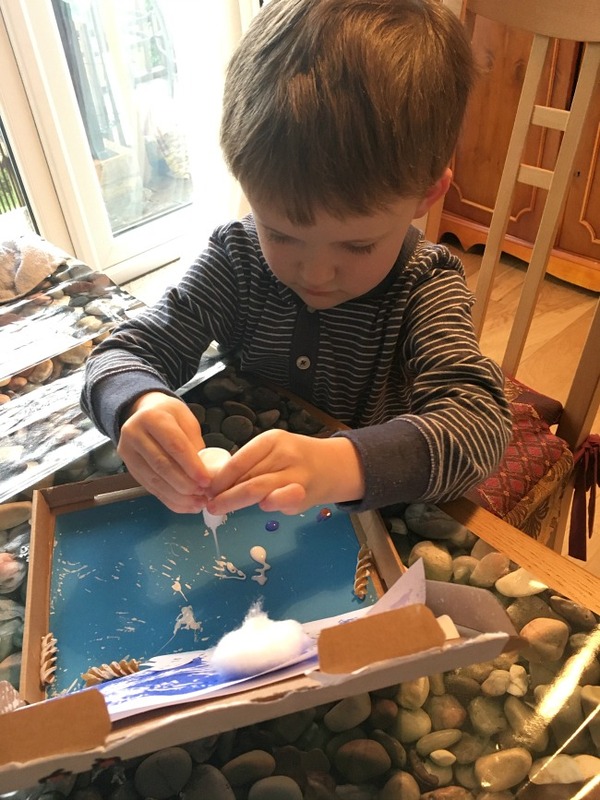 We now had the beginnings of a snow scene. Crafting with a three year old is a joy, a very messy joy, but a joy nonetheless. 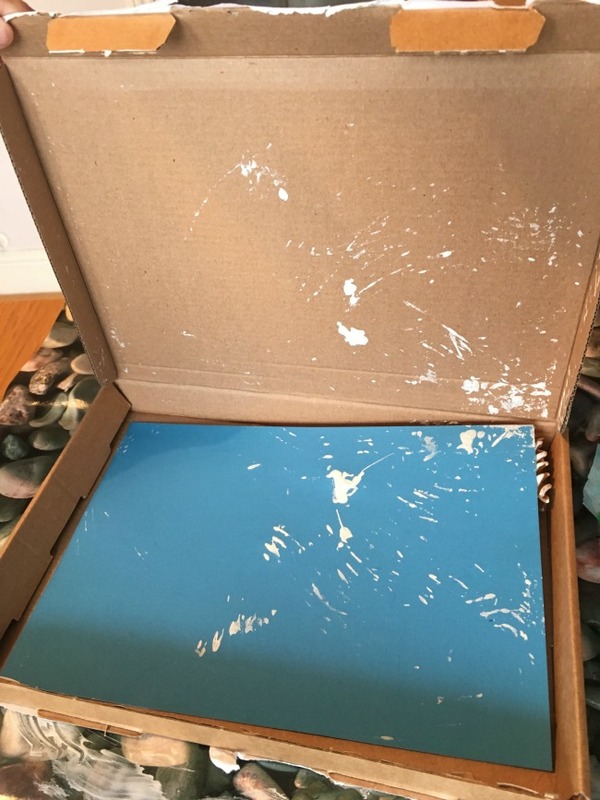 When Bear had opened the box he wasn't disappointed in the paint splatter, that it was only on one side, that it didn't really look like snow. No, he was delighted that the pasta had disappeared! It was magic! Next was making a design on a sheet of polystyrene, using the pencil. 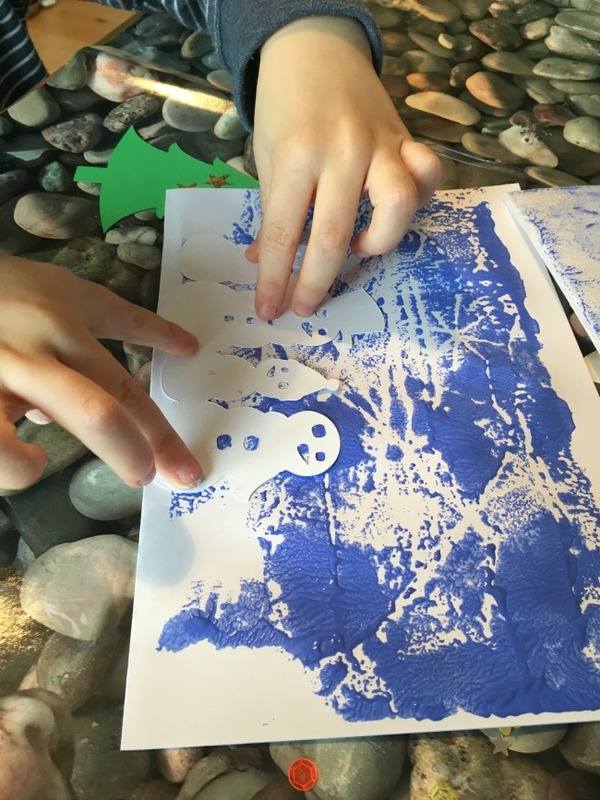 Then using the sheet to print the design on a piece of white paper. Bear drew lines, he can't draw trees or snowmen or snowflakes yet. I drew a couple of stars. I thought afterwards that anything that would leave an impression could be used to make a design, like cookie cutters or play dough cutters. 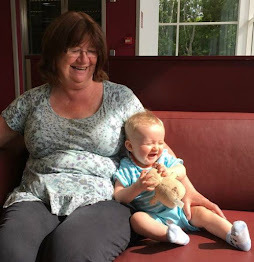 This would be easier for little ones like Bear. 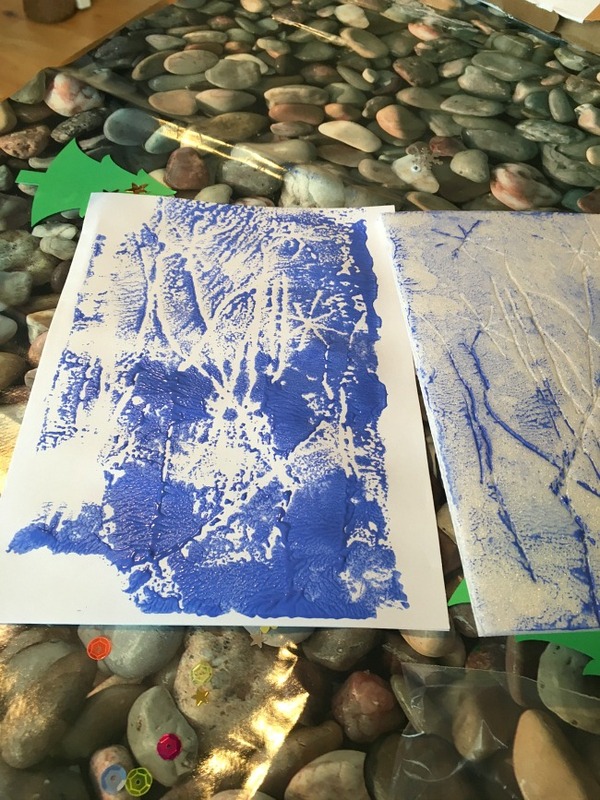 We covered the sheet with the blue paint and put it onto the paper and pressed. Even I was impressed with the effect. This then lined the lid of the box and Bear spent ages sticking things to it. We loved this box, there was so much to do and we didn't do it all. Bear is just three and he managed with supervision and little instruction. He didn't do the scene as described but did his own thing. He particularly loved the tiny bottles of paint. I would suggest wearing some sort of apron, but Bear was feeling a bit under the weather with a cold and refused point blank to put one on. Remarkably he didn't get too messy but it is a messy activity. Full details of the box can be found on the Squidgydoodle Etsy Page, each box costs £12 including delivery. 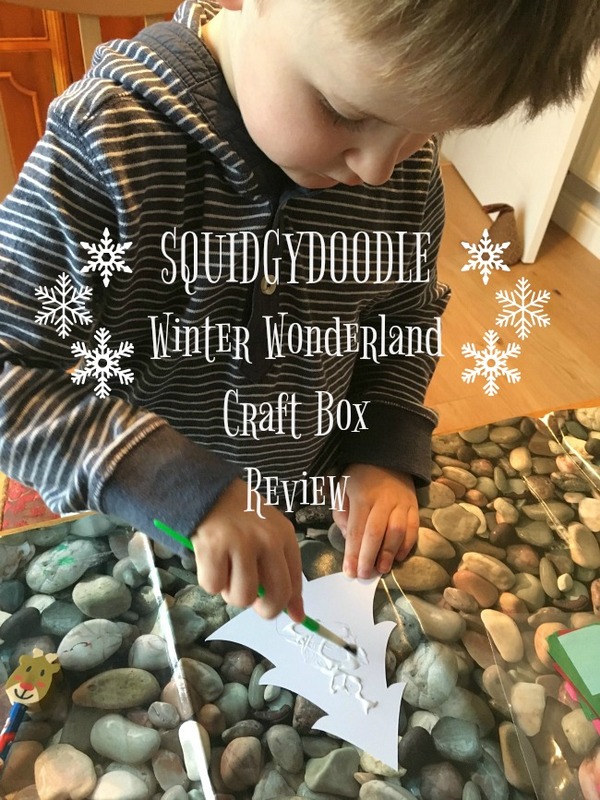 *Disclaimer - We were given the craft box for the purpose of this review. All opinions are honest and my own. Is It Bad Parenting To Serve Junk Food?